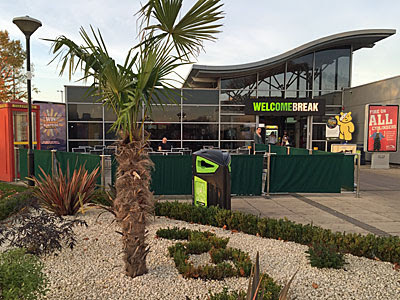 Greater London contains two motorway service stations, the most famous of which is Scratchwood on the M1. Or at least that's what it used to be called, it's now the less memorable London Gateway, and is no longer run by Forte but by Welcome Break. 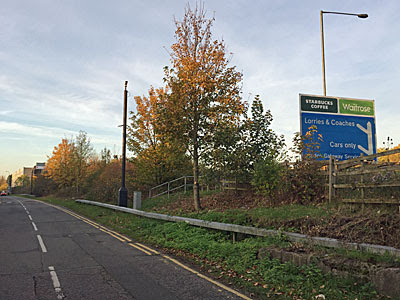 It's located between the motorway and the Midland mainline railway, at approximately the point where the M1 bends west to Watford, on a sliver of land inaccessible except by car. Or at least that's what I'd thought. I was on one of my walks around the suburbs when I spotted an unusual road through the middle of a metal recycling yard. And obviously I broke off from where I'd been intending to go and followed it, and that's how I finally ended up at Scratchwood. Sorry, London Gateway. 1) There is an actual Scratch Wood, just to the north, which the London Loop footpath (section 16) passes through. 2) The services are built at the precise spot where M1 junction 3 would have been (a link to the A1 - unbuilt). 4) Scratchwood had the country's first AA (member recruitment) kiosk. 5) The service area was forced to close in April 2011 when a fire at the aforementioned metal recycling yard melted the M1. 6) The guns of HMS Belfast are trained on Scratchwood services (they really are - Londonist has the story). So whilst almost everyone accesses London Gateway services from the M1, it turns out there is a separate access road. To find it head for Apex Corner, the big roundabout where the A1 meets the A41 (but not the M1, which skedaddles almost underneath). Then follow Ellesmere Avenue, an ordinary suburban street, to the end where the road bends and a minor track leads off. Two large signs alert cars to think twice before proceeding, including warnings about bumps and traffic enforcement cameras, and most importantly, no vehicles except for authorised vehicles. But pedestrians are fine, as a later red sign confirms, even though the pavement rapidly disappears. Ahead is the concrete viaduct supporting the M1, here elevated to cross a minor stream. And beneath that, to either side of the service road, is Apex Metal Recycling Ltd. At the weekend it's quiet, sealed off by corrugated iron emblazoned with warnings about clamping, and a small girl's bike visible in amongst the stacked-up scrap. There's nothing welcoming here, so don't linger. The service road then bends to follow the narrow strip between motorway and railway. A quarter mile yomp follows, past the big sign inviting traffic on the M1 to pull off for Waitrose and a Starbucks. Vehicles have more to negotiate, including a rising block barrier at each end of the straight. Technically you're supposed to wait for the green light before passing, but on my visit the block was permanently down and the light permanently green, meaning any old car could drive through. And a small handful did, presumably unthreatened by the cameras pointing down from stalks and the risk of automatic numberplate identification. But it's all perfectly OK on foot, I reassured myself, and indeed it was. One ugly hotel sits at the end of the drive, within the official service area zone, ideal for anyone who likes to sleep with the hum of motorway traffic. And beyond that is the car park, or as it appeared initially the coach park. A whole row of Travellers Choice coaches were lined up in a state of hiatus, one with a destination of 'Exeter' written in English and Chinese in its front window, while another vehicle had made the long journey from Bulgaria. The cars lay beyond, surprisingly few in number for a Saturday afternoon I thought, but presumably enough to keep the place ticking over. As the last service station before central London, or the first on the way out, Scratchwood has a premium location. The services themselves are absolutely nothing special. A lowrise building with a mildly swooshing roof summons all within, with Starbucks in pride of place inside the front doors. Two key staples of any such building are to the right, the toilets and the gaming zone, the former the key draw on any long journey. For newspapers, magazines and sweets and stuff there's a WH Smith, while for anything slightly more upmarket there's a Waitrose, of admittedly minor proportions but large enough to buy bunches of flowers and in-car provisions. If it's hot food you're after there's a Subway and a Burger King, these with a shared seating area where slightly glum couples can munch on bread-based meat. But if you're after something more substantial like a meal on a plate, for example the traditional service station cooked breakfast, you've pulled off the motorway probably ten years too late. If it's nice, and yesterday it was, you can sit outside. There's even a picnic area out front with wooden tables, ideal if you don't mind a waft of carbon monoxide with your sandwich. Someone's planted a palm tree in a garden of pebbles by the main path, with the letters L G W spelled out in extremely minor topiary. And don't worry, parking's free here for the first two hours, not that there seems any reason to stay longer other than perhaps kipping in your car overnight, for which expect to get hit for £12. HGV drivers pay more, not that there were many of these parked up on the other side doing a weekend run, which again gave the place a much quieter feel than I suspect is usual. The ghost town feel was especially strong at the coach terminal nextdoor. 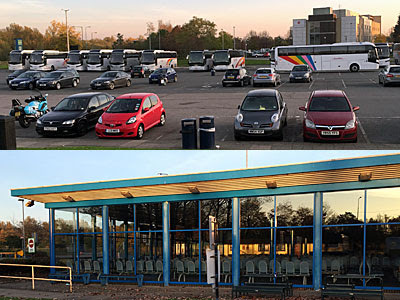 Essentially a large glass-fronted hangar full of chairs, this belongs to Shearings Holidays and is the main hub of their southeast operation. The interchange swings into action just once a day, as feeder coaches bring mostly retired holidaymakers from all corners of Home Counties North ready for simultaneous dispatch at 11.30am. They sit on rows of airport-style seating, or "relax", according to the brochure, and also get the opportunity to "browse the shop". Waitrose it definitely isn't, and the Hot Drinks counter looked distinctively sub-Starbucks to me, in a building clearly constructed with efficiency rather than comfort in mind. I don't know whether you've ever noticed, but all the M1 junctions south of J5 function in one direction only. Driving south you can turn off anywhere, but head north from Staples Corner and you're stuck on the motorway until at least Watford. That is unless you turn off at Scratchwood, and then sneak out down the service road I walked up. You're not officially allowed, and the barriers might be up in which case you can't, but several north Londoners appeared to be taking full advantage of this escape route yesterday. Perhaps Junction 3 really does exist, and London Gateway is indeed well named.